From everyday protection to handy charging solutions, the XQISIT accessory bundle comes with everything you need to get started with your new smartphone. Protect your phone from bumps and scratches while keeping it fully charged on the go with the XQISIT accessory bundle – a great essentials pack for you and your smartphone. Give your new phone ultimate screen protection with the highly impact resistant, tempered glass XQISIT display protector. 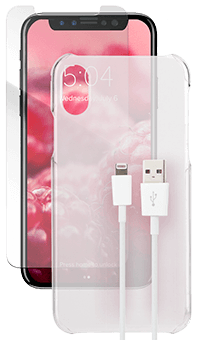 The ultra-thin, crystal clear glass shield offers reliable, high-tech display protection against all those unwanted scratches. Attach the XQISIT polycarbonate smartphone case with a single click and safeguard your phone against scratches, knocks and bumps. The clear, hard cover and glossy finish will preserve your phone's good looks while maintaining easy access to all of its ports. Sync your data or charge your iPhone quickly and easily with the convenient, 1-metre-long, lightning to USB cable that plugs straight into your laptop, tablet and any other USB-compatible device.